In Libya's Shifting Sands, Kids Try To Find Their Way Most Libyans are under 25, and for these young people the revolution has created a new set of possibilities and challenges. After a brief discussion, he is once again focused on his round — oblivious to the heavily armed militias that still jostle for power in Libya, and that were roaming his city that very afternoon. Some people say golf is a microcosm of life, and here, it was a microcosm of Libya: a talented kid in a striped shirt, improvising his way across the sand. 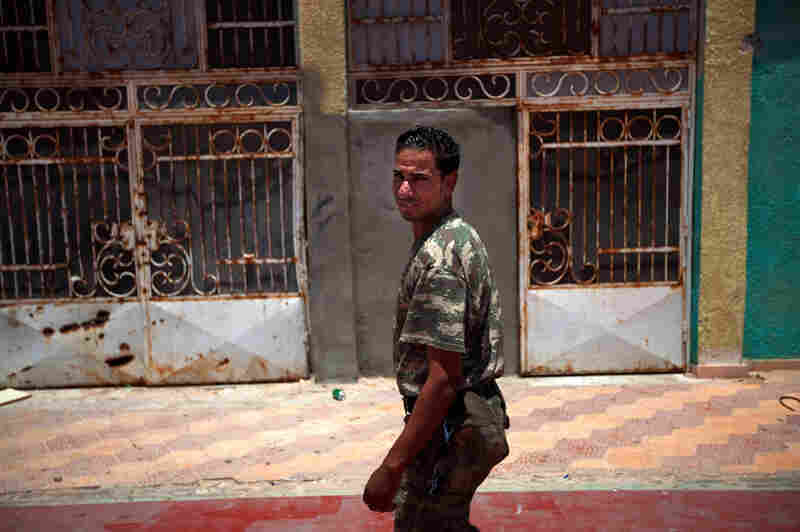 Most Libyans are under 25, and they just lived through a nasty civil war. Three students outside the Science College of Benghazi University. They say they expect to have opportunities in Libya that would not have been possible when Moammar Gadhafi was in power. To assess their prospects, we met students in schools as we drove through the nation, part of our Revolutionary Road Trip across North Africa. In some schools, we found optimism. "We can dream and actually make our dream come true in Libya," says Alaa Barakat. The key words for Barakat are: "in Libya." Before the revolution that overthrew Moammar Gadhafi last year, his dreams involved leaving Libya. We met him at Benghazi University, where students wear Western-style clothes, backpacks over their shoulders. Alaa's classmate Amr Zubehi is inspired by a one-time college student in America. "I want to make a new idea like a Facebook," he says, a reference to Mark Zuckerberg, who established the social-networking site while at Harvard. "Something that makes a difference in the world." It's hard for a visitor to miss Libya's possibilities. Coastal cities curl comfortably around their harbors, and olive groves break up the desert between. Beaches run down to the Mediterranean, which glitters like a great bowl of sapphires. Libyan oil flows into tankers offshore. Schoolgirls outside the Martyrs of Libya school near Leptis Magna, Libya. The country's history books are being rewritten, and Gadhafi's rule is now described as a time of corruption and atrocities. Seizing the future, though, requires Libya's young people to recalibrate the past, as we learned several hundred miles west of Benghazi, at the Martyrs of Libya School in the city of Khums. We ask teenage girls in a schoolyard if they remember the war. "Yes, yes, yes," they say. And did you have relatives who were involved in the fighting also? The winners of that revolution have now changed the school curriculum. History, in particular, is very different from what the girls studied just last year. All the girls wear a uniform consisting of a white headscarf and a gray cloak that to Western eyes resembles a raincoat. Last year's class was all about Gadhafi's achievements — like a famous irrigation project, the girls say. The girls call it the history of one man. And the old textbook symbolizes the way that even children were co-opted by Gadhafi's regime. But by the end of this school year, that text was replaced. The new book doesn't mention Gadhafi's rule until the final pages, and then tells of corruption and massacres. So their books have changed. But it may be harder for students to absorb their own past experiences. Across a 600-mile stretch of Libya, every group of students we met had relatives or friends killed in the revolution. Schoolgirls at the newly renamed Independent School in Misrata. The city was badly damaged in the fighting last year, and many lost friends or family members. At a school in the city of Misrata, you feel the weight of the recent past as soon as you walk through the door. Photos of dead community members hang on the wall. In a computer class, we met Enass Abu Bakr, who was about to turn 15. She said she loves Justin Bieber, that she longs to study in South Korea, and that her uncle fought in the war. He was killed on May 18 of last year, she says. "They said someone shot him from the roof of a building. The bullet came into his face, in his cheek, and he died," she adds. Misrata kids can at least reassure themselves that their side won the war. That's a reassurance that's not available down the road, in a city that definitely lost. At a high school in Sirte, Gadhafi's home city, loyalists fought until their leader was killed here in October. Since then, school administrators have made changes. When boys assemble in the concrete schoolyard, an English-language revolutionary rap blasts over the speakers. Blast holes in the school walls have been repaired, but apartment buildings next door stand in ruins. Inside, we met a group of six boys in their late teens. Three come from families that favored Gadhafi, and three come from families that opposed him. One of the students, Ramadan Turfia, looks a lot like a young Moammar Gadhafi, with the same brilliant smile, the same mass of black hair. He's a member of Gadhafi's tribe, and the other students tease him by calling him "bushif shufa," roughly "father curly hair," a nickname of the dead leader. "I'm from the Gadhafi tribe and he's a part of the tribe, and I love him," he says. Asked if he loves anything Gadhafi did, Ramadan begins reciting achievements chronicled in the old history textbooks. Four of Ramadan's classmates were killed fighting to defend their leader. The vice principal in this school is a former rebel fighter, who has caught some students defacing the Libyan flag that the new government put on the textbooks. Hoping to impose discipline, he's been walking the halls in a camouflage uniform, while carrying a set of handcuffs. 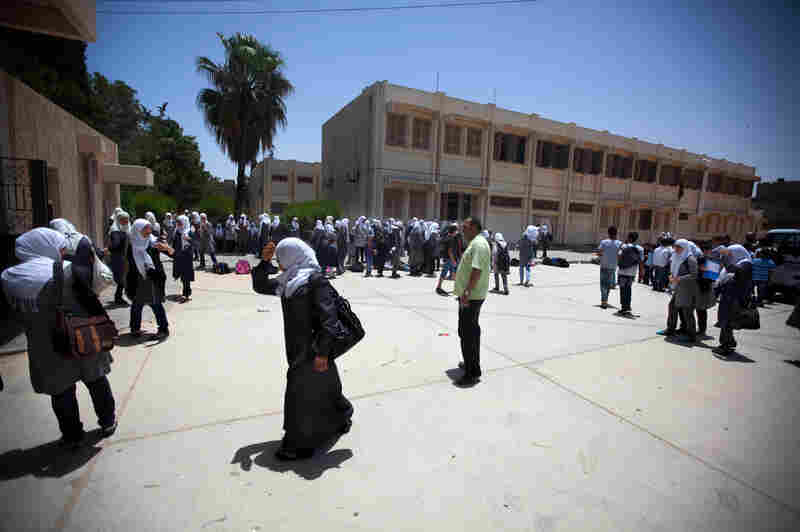 The vice principal at the Okba Bennafee high school, Abdel Mutaleb Suker, is a former rebel who says he started wearing military fatigues to command respect from the students, many of whom come from families loyal to Gadhafi. He confiscated a cellphone, he says, and now he has to smash it because the phone contains pro-Gadhafi songs and videos. The phone came from one of the students talking with us. That student, Thea Yusuf, had a cousin who rode in the convoy in which Gadhafi was killed. An image inside Thea's phone shows his cousin in rebel custody, just before he was killed. To Thea, this is proof his cousin was executed by the rebels. Thea insists his family wants neither justice nor revenge, though a tear comes to his eye as he speaks. The vice principal, who is standing nearby, is even moved. He ends up returning the phone to Thea, along with the pro-Gadhafi images saved inside. Today, large stretches of Sirte are a wasteland, though the Mediterranean still glistens just outside the school, and beach sand drifts down the streets. When we asked the kids in this school about their dreams for the future, their words were vague and faint. What's vivid for them is the past, like the images in that student's phone.